Accommodation along the Karpas Peninsula has expanded somewhat in the last few years, with more opportunities now to spend a few nights on this, probably the most unspoilt, part of the north. Although facilities are mainly basic, there are hotels, motels, bungalows and campsites, offering some of the most beautiful deserted beaches and a very friendly welcome. Places to eat are really limited to the restaurants, bars and catering provided by the hotels, lodgings and campsites detailed below. Boğaz itself offers rooms in two hotels which make a good base for exploring both the Karpas Peninsula and Gazimagusa town, 25km away. Exotic Hotel: Despite its large size, this is a personable place that caters wonderfully for children with a swimming pool with waterslides. Boğaz Hotel: This hotel used to have an attractive outdoor terrace shaded by jacaranda trees; it has a beach across the road and a restaurant serving fish and other seafood. Malibu Motel: This motel offers small bungalows to rent. It is a pleasant spot to stop for a rest, the beach is small but inviting, and it is also home to the Mephisto Diving School. There is a small harbour here too, where local fishermen dock and sell their catch to the Malibu's restaurant. Theresa Hotel: 4km past Malibu Motel is a wonderfully friendly hotel and restaurant with a small beach. With all rooms the same price regardless of the view, try to secure one on the first floor with a balcony and sea view. Arch Houses: Delightful honey-coloured farm buildings, the oldest dating back to 1911, that have been lovingly restored and converted into tourist accommodation. Spacious rooms that come with their own kitchen (including a hotplate) for those who do not want to take advantage of the cafe next door. Oasis at Ayfilon: Standing in glorious isolation in one of the most stunning locations on the island - the ancient ruins and crystal waters combine to form an intoxicating brew. The brainchild of eco-tourism pioneer Michael de Glanville, Oasis provides simple but clean accommodation for those seeking sustainable tourism. Blue Sea Hotel: A few kilometres outside of town, this splendid hotel is a long-time favourite with tourists. Family-run and solar powered, the hotel has some lovely rooms, all with a sea view (at least of sorts) and balcony, with many overlooking the nearby harbour. Livana Hotel Restaurant: Equally charming though much more rustic, Livana offers rooms in its main building or 'tree-houses' (really just huts on stilts with a separate shed for the toilet down below) set on the beach for the same price. Though they are primitive in the extreme (with a bed the only furniture), the chance to drift off to sleep to the sound of the sea is one not to be missed. Livana also has a little restaurant. 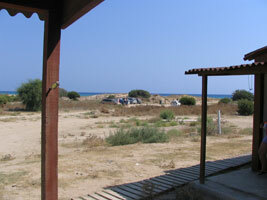 Turtle Beach Restaurant, Bungalows and Camping: This site is located just before you reach Apostolos Andreas Monastery, for years and it deserves a fantastic reference. There are 6 bungalows and a number of tents available, as well as plenty of room to pitch your own. The site is set in amongst the dunes and the sand stretches, clean and golden, for near on a mile and the sea is crystal clear, providing one of the few remaining sites for nesting marine turtles. Golden Beach: Next door to Turtle Beach and in close proximity to possibly the most gorgeous beach on the island is this newer, smaller hotel. Ali's Big Sand Beach Bar and Restaurant: Further along this splendid stretch of beach from the east, Ali's Big Sand offers basic camping facilities. View Hotel: Just before the monastery this large white building on the right-hand side is otherwise known as Dipkarpaz Belediyesi Turistik Tesisleri. It is the closest hotel bed you will find to Cape Andreas. Sea Bird Restaurant: Past the monastery, Sea Bird offers a few rooms to rent, a restaurant and a beach and forms the last building you see before heading off, dust clouds behind you, to the end of the island.